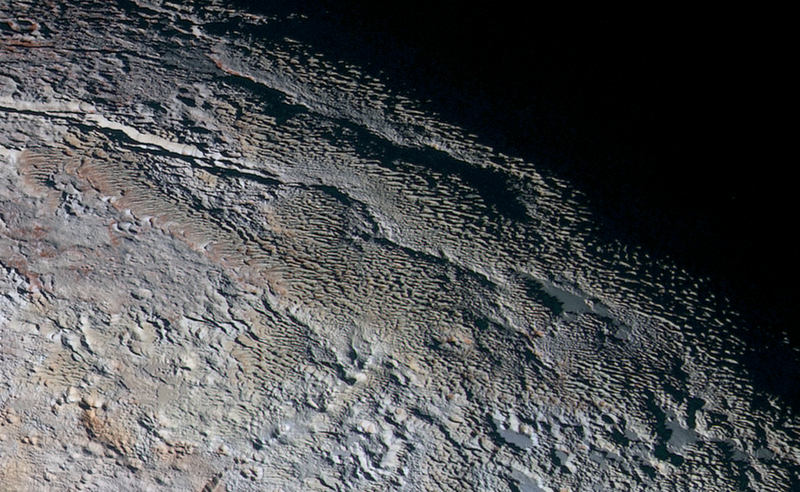 Pluto’s ‘Snakeskin’ Terrain: Cradle of the Solar System? 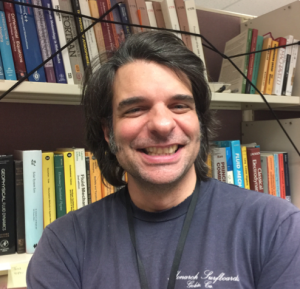 Today’s blog post is from Orkan Umurhan, a mathematical physicist currently working as a senior post-doc at NASA Ames Research Center. He has been on the New Horizons Science Team for over two years. He specializes in astrophysical and geophysical fluid dynamics, and now works on a variety of geophysical problems, including landform evolution modeling as applied to the icy bodies of the solar system. He is a co-author of a graduate-level textbook on fluid dynamics coming out late this spring. Greetings and salutations. In this week’s New Horizons blog entry, I want to share with you the exciting possibility that some of Pluto’s surface features may record conditions from the protosolar nebula from which the solar system formed. A case in point is the image below. It’s what geologists call ‘bladed’ terrain in a region known as Tartarus Dorsa, located in the rough highlands on the eastern side of Tombaugh Regio. (Note that all names used here are informal.) A moment’s study reveals surface features that appear to be texturally ‘snakeskin’-like, owing to their north-south oriented scaly raised relief. A digital elevation model created by the New Horizons’ geology shows that these bladed structures have typical relief of about 550 yards (500 meters). Their relative spacing of about 3-5 kilometers makes them some of the steepest features seen on Pluto. The answer is a meek “maybe.” To date, there are only two known published studies examining the rheological properties (i.e., how much a material deforms when stresses are applied to it) of methane ice in the extreme temperature range of Pluto—a bitterly cold -300 to -400 degrees Fahrenheit. According to one study, the answer is a definite ‘no,’ because methane ice of those dimensions would flatten out in a matter of decades. Yet in another study, methane ice may maintain such a steepened structure if the individual CH4 ice grains constituting the collective ice are large enough. Which study is right? Or is there a way to reconcile them? This is something we simply do not know at the moment. So before we try to explain how the bladed shapes came to be, we have to make sure we have developed a detailed and controlled laboratory understanding of the behavior of both pure methane ice and methane-hydrate ice. If there were ever an example of why we need further laboratory work, this is it! But what if it turns out that pure methane ice is always too ‘mushy’ to support such observed structures? Because water is also observed in this region, perhaps the material making up the bladed terrain is a methane clathrate. A clathrate is a structure in which a primary molecular species (say water, or H2O) forms a crystalline ‘cage’ to contain a guest molecule (methane or CH4, for example.). Methane clathrates exist on the Earth, namely at the bottoms of the deep oceans where it is sufficiently cold to maintain clathrate ice. Under those terrestrial conditions, however, methane clathrates are relatively unstable to increases in temperature, causing their cages to open and release their guest methane molecules. This poses a real problem for terrestrial climate stability, since methane is a potent greenhouse gas. However, under the cold conditions typical of the surface of Pluto, methane clathrates are very stable and extremely strong, so they might easily mechanically support the observed bladed structures. While there is no direct and unambiguous evidence of methane clathrates on the surface of Pluto, it’s certainly a plausible candidate, and we are actively considering that possibility too. If the Tartarus Dorsa bladed region is comprised of methane clathrates, then the next question would be, “how were the clathrates placed there and where did they come from?” Recent detailed studies (see Mousis et al., 2015) strongly suggest that methane clathrates in the icy moons of the outer solar system and also in the Kuiper Belt were formed way back before the solar system formed – i.e., within the protosolar nebula – potentially making them probably some of the oldest materials in our solar system. Might the material comprising the bladed terrain of Tartarus Dorsa be a record of a time before the solar system ever was? That would be something!